A weekly roundup of what's funny (and sometimes what's not) in the world of comedy soundcasts (AKA "podcasts") proliferating on the Internet. Hosted by Marc Hershon. It seems there's something new every time I turn around to do a new 'sode of Succotash. Last time it was our inclusion as part of Stitcher Smart Radio's comedy lineup. This time Jesse Fox's Splitsider.com blog This Week In Comedy Podcasts has tapped me to be one of the contributing writers (which include Bradford Evans, Eli Terry, and Joel Mandelkorn.) So look for me to talk up some of the funniest comedy p'casts we have (and will) feature right here on Succotash. This episode I was happy to lure our booth announcer Bill Heywatt into the studio to share one of his favorite "adult beverage" recipes in our very first Boozin' With Bill segment. I can't attest to the tastiness of anything Bill might suggest but the formula is posted here if you want to test your mettle...and your taste buds. 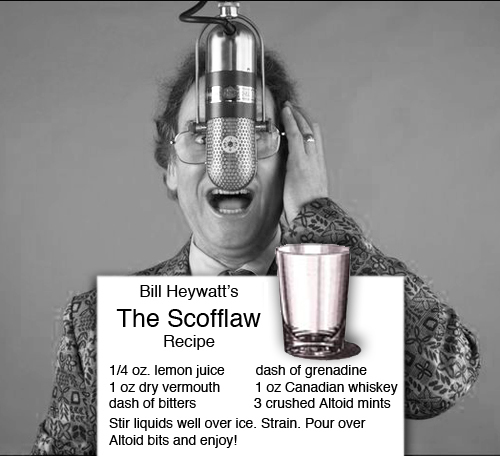 If our listeners enjoy what Bill's mixing up, you can be sure he'll be back with more libations. Hearing Michael Ian Black on the previous p'cast gave me the itch to spinout a clip from MATES this episode. As I mention, I never miss an installment of this funny show with him and Tom Cavanagh. If you're one of their listeners who don't like to know in advance what they're snacking on, Spoiler Alert: This show we clipped was all about Dunkin' Donuts' Munchkins. This episode brings a double dose o' Durst your way. (Will Durst churns out his reports every week so, with our production schedule, we usually have more than we can handle. But not this week!) I actually clipped two Dursts together for the first blast - which is all about how the Republicans can't decide who to rally around. The second BOD is focused on Bank America's decision to heap a $5/month surcharge on ATM users. First time on Succotash, Pod Awful comes to us from New York City, where its billed as a "comedy talk show". Hosted by Jesse P-S (Initials? Alias? Random letters? I can't tell...), this clip also features comedian Glen Tickle. Jesse sent us this clip as being representative of his show, and it features a heart-warming story of a father using a unique test to determine if his son is gay. Been dancing around with the hosts of this podcast to try to get a clip lined up and now we have one! The hosts - Belasco, Booze, Dr. P and Hiccup - cover a variety of topics. They comes from a diverse set of backgrounds, which makes for some...spirited discussions. 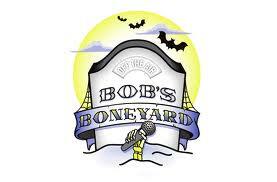 At long last we have a clip from Bob's Boneyard. The guys who run this podcast - Bob Fresh, Manny Torres, and Manny Fresh - have been promising a clip for a while but when I heard one of their shortened offerings (called Bonespurs), the argument about the difference between vampire zombies vesus zombie vampires was too good to pass up. It's fun when I find podcasts being done by people I've known through my long years in the comedy biz. Todd Glass is a classic standup comedian, well-respected in the industry - and it was just a couple of months ago when I sitting in the green room of the 142 Throckmorton Theatre in Mill Valley when he was discussing trying to pull his own podcast together. Well, here it is, part of the Nerdist network! Episodes run two hours and feature Todd, his crew and at least one comedian guest each show, this time with Gary Gulman on board. In addition to our clips and our feature with Bill, this episode features two commercials from our longtime sponsor Henderson's Pants. One of the styles they're pitching, the High-Waisted Hiphuggers, got its genesis from the mind of one of our listeners, comedian Ed Wallick. Thanks, Ed! That's about it. You can listen to us right here on the webstream, download us from iTunes (a review wouldn't hurt!) or give a listen for us on Stitcher Smart Radio! Enjoy this episode and please remember to pass the Succotash! Catch Us On The App! Get your Succotash via email! ©2011 Marc Hershon. Awesome Inc. theme. Powered by Blogger.